First, although out-dated, here is some Easter Island background. News: An email containing photos of a startling excavation project has inundated inboxes. According to the email, the mysterious Easter Island statues — hundreds of huge, ancient carved stone heads that guard the hilly Pacific island landscape — actually have bodies. The email says archaeologists are now unearthing the statues' bodies, which were gradually buried by 500-plus years of erosion. But are the surprising images, and the excavation project they depict, actually real? Are the famous Easter Island heads really full-bodied figures? Turns out, so many people have been seeking an answer that "we were swamped by over 3 million hits and our site crashed," said Jo Anne Van Tilburg, director of the Easter Island Statue Project(1) , which has indeed been excavating two of the statues' buried bodies since 2010. Photos of the dig posted on the project website, and older photos taken of full-bodied Easter Island statues that were excavated in the 1950s, have been collected together in a chain email, driving the recent surge of interest in the excavation project, and confusion about what's real. "The reason people think they are [only] heads is there are about 150 statues buried up to the shoulders on the slope of a volcano, and these are the most famous, most beautiful and most photographed of all the Easter Island statues," Van Tilburg, who is also a fellow at the Cotsen Institute of Archaeology at the University of California, Los Angeles, told Life's Little Mysteries(2). "This suggested to people who had not seen photos of [other unearthed statues on the island] that they are heads only." The new excavation work intends to document for the first time the complex carvings found on the buried statues' bodies, which have been protected from weathering by their burial. But the project will also help preserve the ancient monoliths(3), she said. "We have a team that accompanies us and they consolidate and protect the stone by applying chemicals and water repellant." OK, so what does Snopes(5) have to say about this? Origins: The 887 monolithic human figures carved from rock on Easter Island (known as moai) are familiar to many people through iconic images(6) that show the statues to be either just heads or a combination of heads and shoulders only. That conception of the Easter Island statues as nothing more than giant heads is reinforced by the fact that the heads on the statues are disproportionately large in comparison to their bodies and the circumstance that the bottoms of some of the statues are set deep into the ground. Although many viewers are surprised to learn the moai actually do have bodies, that information is not a recent discovery: many of the moai are situated fully above ground and are therefore displayed(7) in their entirety, and some of them even sport arms and red hats(8). 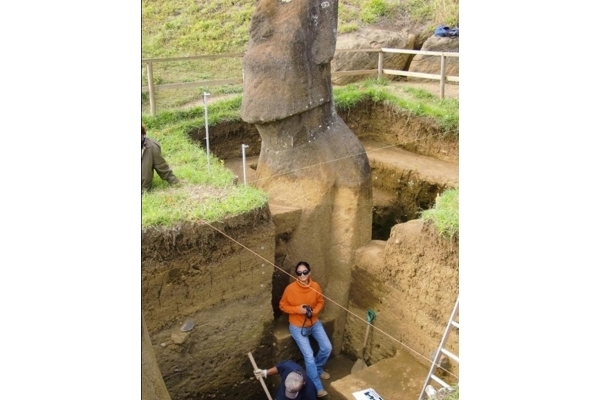 In recent years the Easter Island Statue Project(1)) has undertaken efforts to excavate and study some of the moai, thereby revealing previously hidden portions of the statues.